After reading the book, I agree with the author’s statement. He also writes in the book, “This book is not intended to be theoretical, philosophical, or even theological. The goal is for it to be both biblical and practical.” And that shines through. There’s a heavy dose of scripture and real-life examples offered from Kevin’s life. This is a testament to his journey and findings as he, and his clients, have discovered as they have given themselves over to God’s will. Easier said than done. Right away, Kevin states that the process of surrender is messy. There’s a bunch of “me” involved. And, as we read along, Kevin shares his process while action steps and practice implementations, followed by a prayer time. One of my favorite action steps, though maybe morbid, was making my own death certificate. Followed by prayer, this provided a good reflection time about my own will versus surrender. There’s enough here, though a smaller book, to allow everyone to find their own notable moment. This book is heavier on the evangelical belief of battles with the devil. I know people will come into this book from all kinds of Christian beliefs, so I wanted to make note of that ahead of time. Kevin offers plenty of scripture and the points are well taken. 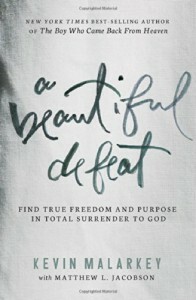 All-in-all, A BEAUTIFUL DEFEAT accomplishes what it sets out to do: remind us of our purpose and guides us into a more meaningful life in His will: all without being overbearing or highbrow. Thanks to Nelson Books for sending this over for me to review. On Goodreads, I’m giving this three stars because “I liked it”. On Amazon, I’m giving this four stars because that is their "I like it".